Fretful late nights fiddling with icing? Yep, we’ve had a few of those and so has baker Anna, but her reasons for volunteering for us are beautiful. 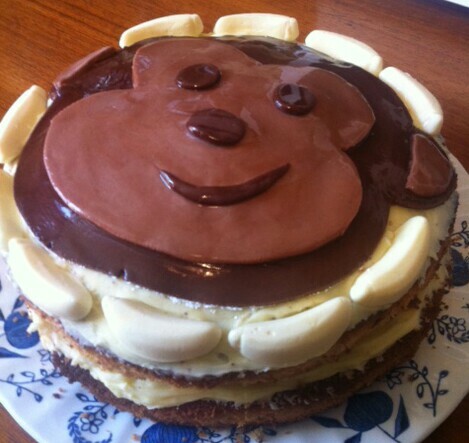 And who doesn’t love a monkey cake? Oo, oo, oo, not us! Cream together the butter and sugar until fluffy. Crack an egg into the mixture, then sift 1/4 of the flour into the bowl and fold it in with a metal knife. Repeat with each egg and the rest of the flour until it’s all combined. This prevents your mixture from splitting. Bake in a 180 degree oven for about 30 minutes, or until a knife comes out clean. In a bowl cream 60g butter until maliable, then add icing sugar until it’s your desired consistency and taste (some people prefer more buttery, some more sugary!). Add 1tsp vanilla essence. When the sponge is cooled, slice it in half lengthways and spread the icing over one half of the sponge, then spread jam over the other half to make the sandwich. Half a pack of white royal icing. Split in half and knead in cocoa powder until desired shades of brown are achieved for the monkey face (one darker; one lighter). Roll out (using plenty of icing sugar so it doesn’t stick to anything) and cut into face and features shapes. Assemble on top of cake. Use warm water and a pastry brush (sparingly) to stick them together, and to clean the top for a shiny finish. Decorate with foam banana sweets! I’ve lived in Hackney for years and I work as a volunteer manager for a Hackney-based charity, so I am really passionate about the community of our borough. I’ve been baking for Free Cakes for Kids Hackney for about 2 1/2 years, and I’ve seen it grow and develop so much in that time. Everyone I tell about the charity thinks it’s amazing. I love the idea of turning baking into something altruistic – it’s such a fantastic way of bringing our community together. Personally, I love the challenge of creating something to spec (although it’s meant a few fretful late nights fiddling with icing!) and the thought that a kid somewhere is going to open that box and hopefully light up with a smile on their birthday. What kid doesn’t deserve that?